Your browser is unable to play this audio. TV PROMO DEMO From Soft to Powerful -- all at the turn of a phrase! Willyard Portrays Lincoln! This acting role is on display in the Nat'l Marine Museum in D.C.
John - Radio Voice Actor A well-received Memorial Day "Soliloquy"
John is THE voice of KUPL This Promo is a wild ride of vocal acrobatics! John Willyard: News John's News demo. "Breaking News", "Tonight at 11" - John does it all! John WIllyard: Political John does Political, but he's not running for office.... he's talking about yours! John Willyard: Commercial C'mon - wouldn't you think it would sound awesome to have John voicing your new campaign? 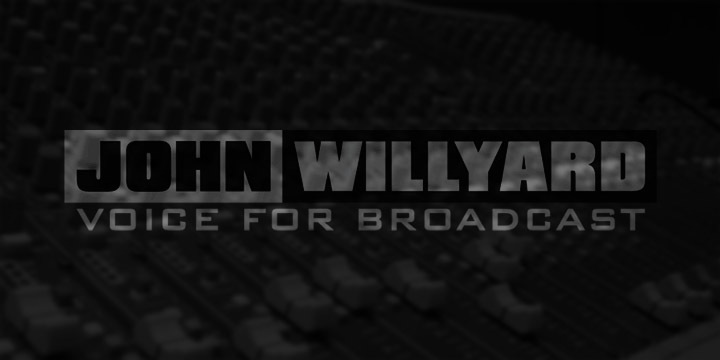 John WIllyard: Promo Promos, promos and MORE promos from the one and only John Willyard. John Willyard's voice is utlilized on FOX-TV O & O's and affiliates (one almost 20 years! ), ABC-TV affiliates, NBC-TV Network, AXS-TV, CNN and recently the voice of a Jimmy Kimmel parody spot. Heard on over 90 of the most dominant Country, Classic Hits and Classic Rock radio stations in North America -- from Sarastoa to Portland, San Diego to Philadelphia. "John Willyard is the premier radio voice actor in America. You may notice that I said “Voice Actor” and not “Voice Over” talent." "The reads are dead on...you make the script come to life!" John Willyard’s unmistakable voice is heard in a permanent exhibit on the tour of the Country Music Hall of Fame and Museum in Nashville. John has been the official voice of the CMA Awards since 1996, CBS-TV and now ABC-TV. Over 7 Million Hits on You Tube for movie trailer type spots in which John voiced OFFICE 2010: The Movie for Microsoft Word. His voice acting portrays President Lincoln in an exhibit at the National Marine Museum in Washington, DC. John lends his energetic voice to highly successful TV commercial ads for Hyundai, Ford as well as Toyota in multiple regions in America. He's also sensitively narrated everything from the toughest medical terminology in pharmaceutical narrations to the Goldman Sachs story to "The Mighty Saturns," the history of early space flight. Date of Birth: June 7, shares with Tom Jones, Prince and Liam Neeson. Favorite Sport/Activities to Do: Golf and Trail Running. Loves Travel and Photography. Career Shift: Concentrated on entirely voice overs for a living in 1991.